We know this looks like a lot of our other LEDs, but it's not! This is a PTH Addressable RGB LED with a WS2812 (or "NeoPixel") control IC built right into the LED. This PTH version is incredibly similar to its SMD cousin, except it is a lot simpler to solder into your project and is in a clear 5mm package. This RGB LED has the control IC moved into the actual LED, so we wanted to offer this amazing product to you! They’re great when you need a lot of color from not a lot of board space, now more so than ever. 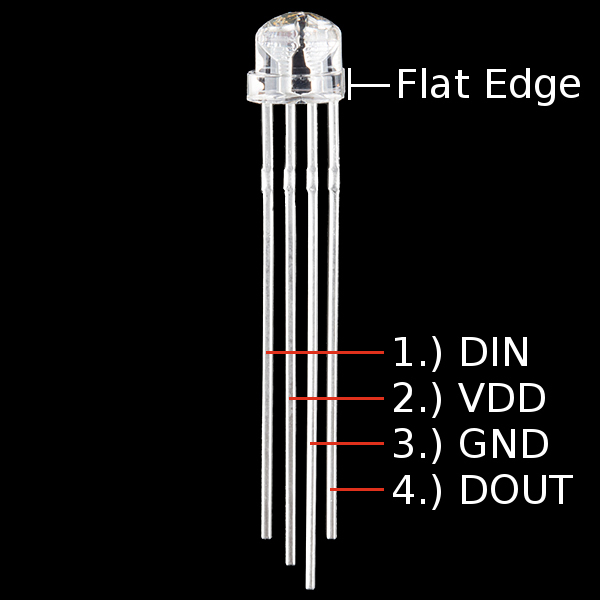 The datasheet for the WS2812 addressable through-hole LEDs is not clear with the pinout. For reference, you can refer to the bulb’s flat edge and the length of the terminals as indicated below. I've worked for a while with these LEDs and have a important notice if you would like to drive a large number (>60 leds) on one line. The integrated chips are not WS2811/WS2812 and have a different timing (compare the datasheets with WS2812). The used frequency of this leds is ~ 585kHz. If you use only a small number there are no conflicts with the neopixel library, but if you use a large number you will get funny flickering (on the last leds). Befor your waste your time to proof your power-supply or your used cap - keep in mind that you need to adapt the timing of the neopixel-library. After that I had no problems. Dear sparkfun team please put a note to your product. I've invested one weekend only to find these difference and now I'm very happy with these beautiful leds. If anyone need the adapted neopixel library code, reply and i will post it. This is not your typical RGB LED like the WS2812, It is coded GRB instead. I have altered the definitions file for the WS2812 to properly work with this specific LED. You can grab the file here APA_106 Definitions.h Hope this helps to get the correct colors you want. Hmmm. To make a 320x240 (QVGA) display out of these things would cost $36,249.60. Your math is off, I think. $181,248. 320x240 = 76,800. 76,800 * 2.36 = $181,248. edit: i was wrong. they're in 5 packs. d'oh. Actually, Harrkev is right. They're $2.36 per 5 pack, not per LED. And if you pack them as tight as possible it's only 1600x1200mms. Not much of a jumbotron for 36K. But you could do some pretty cool POV display stuff. I'm thinking a full color bicycle wheel display would be cool. Maybe 32 or 64 in a string. Maybe two strings spaced 180 degrees apart to give a high refresh rate since bike wheels don't rotate too fast. Yeah might have to grab some of these for testing. for POV, these will work but wont be crisp, due to the timing based protocol, they don't end up properly in sync unfortunately. Hi! I'm trying to control these leds (12 in total) with an arduino pro mini 3.3V 8Mhz powered by a LiPo Battery (3.7V 1100mAh) . I'm using Adafruit Neopixel Library on digital pin 4 but they turn up blue and stay that way. I tried the same strip on a typical 5V arduino uno and works perfectly (so the connections are not a problem) . It's about voltage, right? I'm connecting the v+ input of leds to the raw pin where I have the battery connected. Curiously, I also have a 12 leds strip of these ones: https://www.sparkfun.com/products/13282 and they work perfectly on arduino pro 3.3v 8Mhz . Is there anything that I can try or just consider moving to SMD? Thanks! Does anyone have a sample setup and code I can use? I am a noob at these and want to know how to use them properly. Thanks! I bought some of these from Adafruit awhile ago and they work great! I am running them off an ATTiny85 and 4 AA cells and I had to back the brightness off. If you follow the NeoPixel guide you will be in great shape. Do be careful when you connect them, I toasted a couple when I accidentally bumped my power supply voltage up to 7.2 volts from 5 volts! It was not pretty! I like the water clear version because it is much brighter! And you cannot beat the price! I paid $4.95 a pack from Adafruit when they had them. Are there plans to keep these around? I got some from Adafruit recently and was seriously distressed because they've been discontinued over there. These are PERFECT for 90% of the projects I've got in the works because tiny! (wearables!) thru-hole! (props!) and MOST importantly clear! (for fiber optics!) There are plenty of ways to diffuse an led but exactly zero ways to un-diffuse one. I need to know because if this is the only stock you plan on having I may need to clean you out (actually not joking). The question is when these will be incorporated into a new revision of this: https://www.sparkfun.com/products/8033 ? Obviously you just need to take the inputs over SPI and have the Neopixel library handle the one wire of the WS2812. The data sheet is almost use less!! Spark, did you bother to check what is needed to transmit the data path format for using it??? "The data are sent in a sequence containing 24 of those bits â 8 bits for each color â followed by a low Reset pulse of at least 50Âµs. The channels are in the order Green, Red, Blue. The larger the value of a specific color is, the brighter it will be. If every color is set to 0, the LED will be off. If every color is set to max (255) the LED will be brightest white. Because the interface is so time-specific, you will need a real-time processor like an Arduino or Propeller to run the LEDs. Microprocessors like those on the Raspberry Pi or pcDuino can't give you a reliably-timed pulse; even if one bit is less than a microsecond off, that could mean the difference between purple and maroon." Same goes for the 5mm version, without the above, your just getting a very tiny doorknob! Has anybody else noticed that the pinout designsations and the application note schematic don't match on the datasheet? Here's a nice picture showing the correct pinout, and here's a better timing diagram. Hi! These look cool but the data sheet says "timing waveforms" have pulses 0.35 usec and 1.36 usec +/- 150 NANOseconds. How to do that with an AVR or similar? These are based off the same chip that the newer Adafruit Neopixels use. They have developed a great library and many hook up guides, etc, for this product. Does anyone have a typical hookup for this? With the clear, don't expect to be able to "see" the color from the LED without a diffuser. i.e. a wall that its aimed at or some sort of opaque medium. These are great, but that is a limitation of this particular form factor. You can see most of the colors well enough without a diffuser, but no doubt it would help. I have 5 dozen of these purchased from another site, and they're pretty darn bright even in daylight! How is this different from COM-12986? COM-12986 is diffused, this one is clear. Also, these are 'straw hat' form factor whereas COM-12986 are full height. Work well, with one caveat. These LEDs work well with the NeoPixel library, are super bright, and a lot of fun to play with. The adafruit best practices list the following: a 300 - 500 ohm resister in line with the data pin (as close to the LED itself), and a 1000uf 6.3v capacitor or better across the power supply + and -. I did not know about this at first, and wound up burning out an LED as a result. When I messaged Sparkfun about this they confirmed this was needed, and pointed out they mentioned this fact...in a hookup guide for the WS2812b. This hookup guide isnt linked here. Im somewhat dissapointed that this isnt mentioned anywhere here on the page for this product, and the hookup guide isnt even linked here. Without these in place, running example sketches with the NeoPixel library stands a HIGH chance of burning out the first LED in the string. Overall, pleased with the product, a little let down that crucial information wasnt provided here. This is my first time working with the WS2812 and I am extremely impressed. I did fry one trying some things out before I read enough documentation but the information is out there and not complex--so buyer beware, read up before you plug in. There are a number of other projects that I will likely incorporate these into, but as already assembled strips or rings, not single LEDs. I wish I could have gotten away with using a strip of these for my current project but the through-hole type is the only thing that will work. That said I am glad that I can acquire and control single LEDs the same as the NeoPixel strips. These are a little more complex than regular LEDs as you have the 4 pins to deal with time and time after time but the Adafruit NeoPixel library is super easy to use, so once they're wired up control is a breeze. I am excited to try the strips, rings and matrices when those will be appropriate to the project, as the major complication (4 pins over and over and over again) will be eliminated by using an assembled package. It looks as if a small percentage of the "pixels" may not perform as expected; 2 or 3 of the 65 that I purchased seem to have bad data pins. I usually buy about 10% more than I need of things like this, so I am covered, and I would recommend that anyone who is planning on using these also acquires a few more for contingencies. Cons: Library seems to be a bit buggy: Sometimes the LEDS wouldn't light correctly(every once and a while), The library as is takes G,R,B order for setting a pixel color but the definition file defined is R,G,B meaning you have to change the library or definitions to get them to work correctly, neither of which I have attempted.